The four related snaps on the rear fender wells were in fine shape as were their rivets. There are no fiber washers on these rivets. I noticed that while the tails of the other four rivets were exposed to the road surface the fender well snaps are not. I used a common cheap rivet gun and I noticed a problem with these snaps. The face of the tools rivet die is wider than the recess on the top of the snap where the rivet goes. You need to use some #4 washers as a spacer between the face of the rivet die and the rivet head in order to get a solid installation. My fuel pump cover was not attached to the car when I bought it. The rivets had failed and here is another likely place for stainless steel rivets. When re-riveted to the original location the lid does not fit square over the hole on my car. You can see the ground through one corner. The front corners of the lid are secured to the parcel shelf using screws with cup washers. There are four holes on the lid for rubber bumpers, this is a remnant of the Alpine configuration with the battery mounted in this location. There are four 1/8" holes rear of the fuel pump lid on my car. Two of these are located directly behind the inboard hinge and are for a fuel line clamp riveted to (and from) the bottom of the car. The clamp was missing from my car. The clamp is simple and a reasonable facsimile can be made from a strip of sheet metal. My replacement was made from a strip of matal about _" wide and a couple of inches long. There are two more holes rear of the lid but positioned between the hinges. One of these is for the carpet snap. There is also a 1/8" hole on the other side of the shelf for the carpet snap on that side. The two slots and accompanying holes at the front edge of the shelf do not appear to perform any function. There are five more holes on the shelf. There are two _" drains on each side although not symmetrically placed. These four holes have rubber plugs in them. 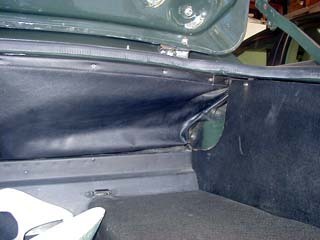 There is also a small hole (3/8") at the rear of the shelf on the driversÕ side; this may also be for drainage. I do not know if this fifth hole should have a rubber plug, I used some spare plugs out of a grommet kit I got from Rick at SS in these holes as well as the holes with the slots. The location of the carpet snaps is located HERE.